I have to admit - this wasn't the shot I was after that day. 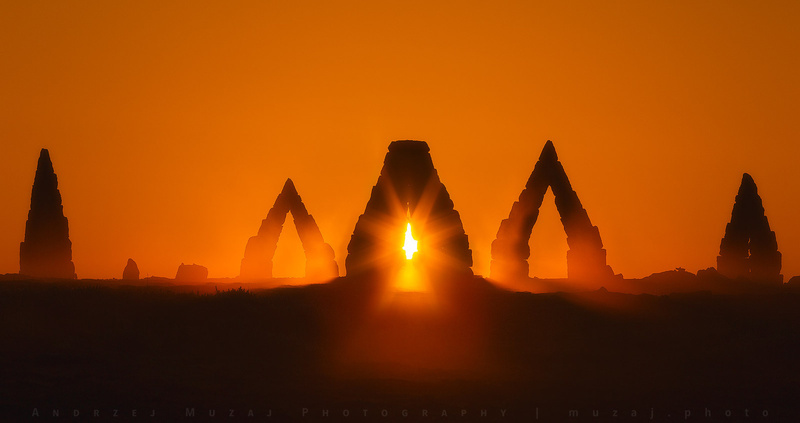 It was one of the few days during a year, when a rising sun can be seen exactly through the three of the "gates" in the Henge. But, as usual, weather didn't cooperate - there were thick clouds low to the horizon, blocking the sun during it's initial peak through the horizon. Nevertheless, I'm quite happy with the result. Beautiful shot. It looks like a shot from the movie Stargate. Magical and very otherworldly! Great job. The Photo Of The Day Award is well deserved. So killer! Everything is great. Wow this is really stunning, this is the first time I see this, incredible shot !